Thirteen paintings created by Adolf Hitler have failed to attract a single bid at a Shropshire auction. The artwork was up for sale in a historical documents sale at the Mullocks auction at Ludlow Racecourse yesterday. The works included oils, pastels and watercolours, along with an etching of the Nazi leader playing chess, which was apparently created by his Jewish art teacher. 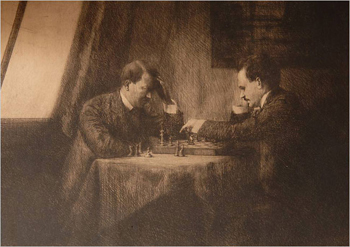 Richard Westwood-Brookes, for Mullocks Auctioneers, said: “The etching shows two people playing chess in Vienna in 1909. One is Hitler and the other is Lenin. Mr Westwood-Brookes said the vendor’s father had devoted his entire life to proving the authenticity of the work, leading to the production of a 300-page dossier which includes forensic evidence, signed witness statements and affidavits. Mr Westwood-Brookes said he did not know why the paintings hadn’t attracted any bidders. A previous sale of Hitler’s works earlier this year had raised £95,000.